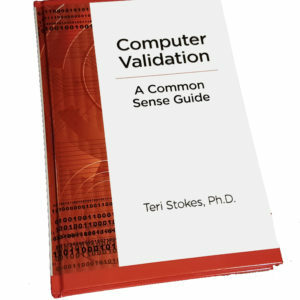 This book was designed to share practical ideas that have been shown to work well in a variety of computer validation projects and global regulatory environments. These practices are not the only way to perform computer validation, but they are one way that experience has shown to be workable and inspected with positive results. In chapter appendices there are 29 full scale examples of validation document sets, policies, and SOPs from real projects to illustrate the concepts discussed. In Unit 1, an extensive glossary of 80 validation-related terms provides the reader with quick access to definitions that are understandable by non-IT professionals. To support focused and distance learning, this book is available as PDF downloads in specific training Units. Dr. Stokes has used these Units herself as pre-seminar reading assignments for participants and also for Case Study exercises and Round Table discussion topics. They provide a flexible training program for all levels of expertise in FDA regulated industries where computer use is subject to Good Practices (Clinical, Manufacturing, Laboratory, Part 11). Each Training Unit listed above (1 – 8) can be purchased below for $20 and downloaded as a pdf file. All 8 Training Units can be purchased below for $80 and downloaded in one zip file. After you view your Cart, and proceed to checkout, you will be taken to Paypal to complete the purchase. After your payment is complete a Receipt page will be displayed, and below the name of each purchased item will be a link to download that item to your computer. You will also receive an email from GXPInternational that your order is complete, and that email will also have a link for the download of each item purchased, to be used if you missed using the link on the Receipt page.